Not that it spilled out over all the front pages, but after two weeks of protests in Leeds, London and Manchester, the British ‘quality’ press, which saw it’s gag order relieved, is starting to come to terms with what the British ‘tabloid’ press has long recognized: the case of imprisonment of Mr Tommy Robinson has turned him into a martyr for the far-right, and has turned their conspiracy theory of an abolishment for free press in the UK, into a reality. The martyrdom of Mr Robinson has by now taken on such a stride that this weekend one of the biggest Chinese newspapers (the South China Morning Post) even did an article about his case. Gulfnews in Abu Dhabi is also discussing the matter. 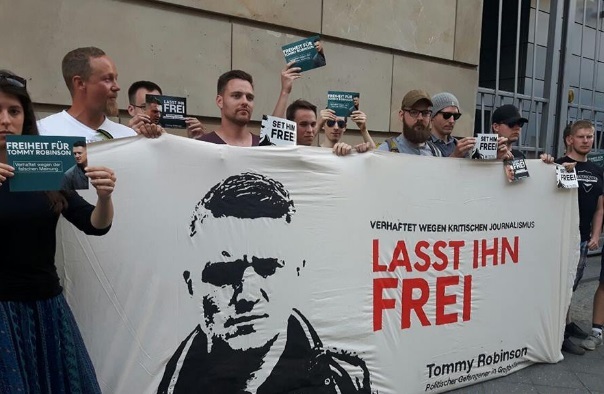 In Germany, Berlin police were surprised to see a (peaceful) rally asking for his release. The matter has gone worldwide. Over in the US, his popularity ever since his arrest has only grown. The far-right activist and founder of the English Defence League, who is currently serving a 13-month sentence for breaking reporting restrictions at a jury trial had recently spoken at an event entitled Ground Zero, held on the anniversary of 9/11 where his then host, the activist Pamela Geller, has brought his case to light in the US this time round again. Some 600,000 people have by now signed the petition asking for his release, which normally means the matter must be discussed in parliament. Although British television stations like Sky and BBC are not openly discussing the issue, the UK’s Prime Minister Ms Theresa May must realize that with this kind of growing media attention, it is only a matter of time before she will hear the chant of ‘Tommy, Tommy, Tommy’ when stepping out into the public eye and the first question by a reporter during a live interview seems only days away. 1- petition is not a uk gov one. 2- petitions over 100k do not need to be discussed in parliament. Please check petition dot parliament dot uk Biff. All petitions over 100k need to be discussed in parliament. British law is not available under the EU! Once Brexit happens and British law is supreme, then the case against the EU's ligitimacy is fought and won, only then will British patriots be able to stand and fight for their country's future!